Finding an area that is easily accessible by you but out of the way of others is recommended. You should consider how you’ll bring equipment, tools and other supplies to the garden - and how much time and effort that might take as you expand your gardening endeavor. Gardening should be fun! Your space should be convenient, clean and private. Starting a grow in an area that is unstable will prove unsuccessful every time. Finding an area that is easily accessible by you, but not others, is recommended. You should consider how you’ll bring equipment, tools, and other supplies to the garden. How much time and effort will this take you? Pests can be a problem for those careless enough to grow in a space that is easily penetrated by the outdoors, not cleaned properly, or receives frequent visits from animals and people. It will likely become clear to those who spend some time pondering the perfect location that this is more than a garden - this is a hobby that will give you lasting enjoyment. Depending on the size of your grow area you may need to consider leaving some empty space that allows you to work when inside the garden. Keeping a clean area to mix nutrients, store supplies and harvest your plants when the time comes should be on your list of priorities. Believe it or not, not everyone in your house, apartment or neighborhood wants to smell the rosemary you just trimmed. Keeping your grow area contained within an environmentally stable and odor friendly space is important. For this, you will need a really good ventilation system. You can learn more about that here. Having a room with plants from wall to wall is cool, but not practical. Even with automation, I encourage you to consider space for yourself. Have extra room to walk around your plants. Automated pumps and controllers require inspection and maintenance over time. 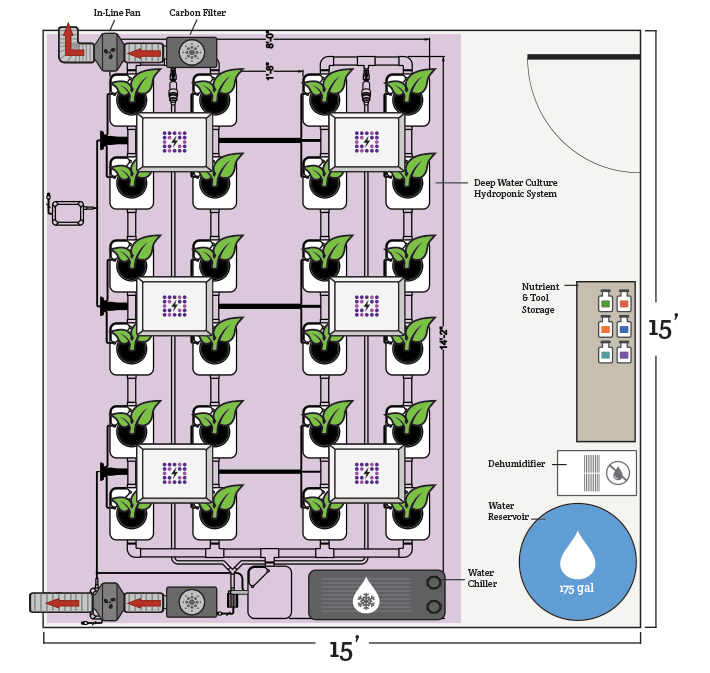 Learn more about automating your grow room here! You’ll need to trellis or stake plants as they grow and you’ll want to inspect the plants to determine if any problems exist. Tasks like these are inhibited or impossible without proper planning. A 2ft-3ft walk way is ideal though not every room will be large . Vertical height requirements are typically around 8’ but sometimes a 9’ or 10’ ceiling is necessary when using high wattage & high intensity grow lights. 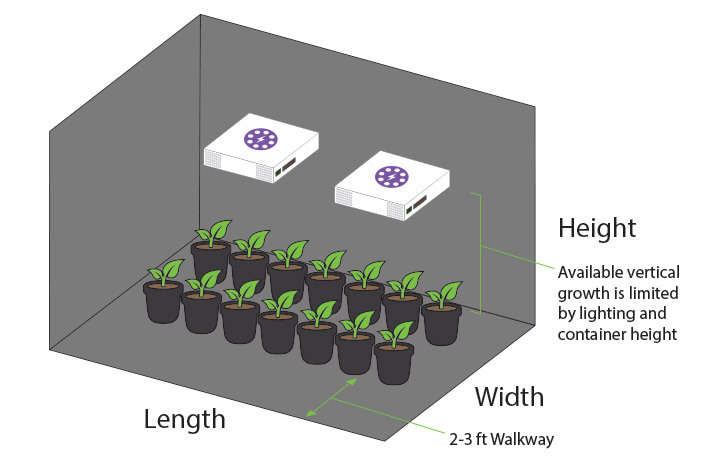 If the container your plant sits in is 12” tall, and your grow light reflector is 12” tall and needs to be hung 30” above your plants’ canopy then you’ve already consumed 54” (4.5ft) of vertical space. In a room with an 8ft tall ceiling you would have 42” (3.5ft) of ‘safe’ vertical growth space for the plants. In a 6ft tall room you would have only 18” (1.5ft) of available vertical growth space. If you are limited on vertical space, you will likely want to grow many smaller plants vs fewer, larger plants which will grow much wider and taller and consume more space in your grow. A common mistake for beginners is to cram too many plants into an area which forces the plants to fight for light energy which creates a dismal yield filled with small, airy flowers. In most cases, it is better to grow fewer plants that have enough available light energy to produce a strong yield. This balance of the number of plants in your grow room vs the available grow space and light is critical to the success of your garden’s yield. In this example the entire room was converted into a grow space. Two grow tents in the same room allow this setup to have a perpetually cycling harvest. 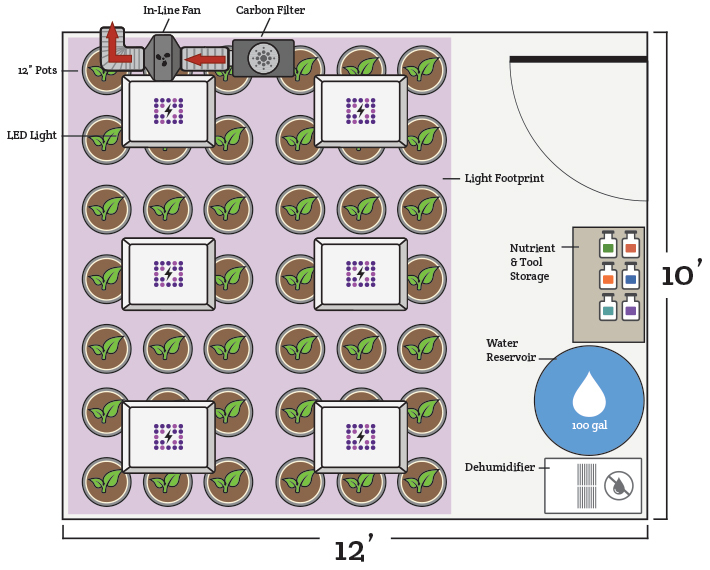 While the plant count is reduced with this setup, the powerful hydroponic system will more than make up for it with larger, faster yields! 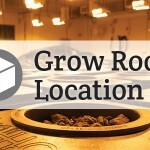 There are a number of ways you can set up your grow room. Want to see a wide variety of blueprints? Check out our blog post on examples of common grow room designs. Today’s grower has the privilege of working with the most advanced lighting technologies on the market. No longer are we required to use loud, hot, large magnetic ballasts. These outdated lighting components require more maintenance and cause radio-frequency interference (RFI). Thankfully, digital ballasts solve many of the woes from the past. Today’s grower has the ability to cultivate a superb harvest with less energy and less heat output from the lights compared to a decade ago. This allows your air conditioning equipment to run less, saving you money (among other advantages). Still, some grow rooms require adequate power from a 240v connection rather than your standard 120v house plug. Amperage is what matters most when sizing your grow to the available power you have in the space. Standard house plugs are typically 15 amps and bathroom ground fault circuit interrupter (GFCI or GFI) circuits are typically 20 amps. Grow lights will use anywhere from 2 - 9 amps depending on lighting type, wattage, make and model. This means a typical breaker inside of your average home will only handle one or two high intensity lights that require 9 amps at 120 volts to run. Using a 240 volt breaker will cut the amp draw in half (9 amps becomes 4.5) allowing you to run more lighting off of a single breaker. Typically, the number of plants you grow is determined by the size and number of lights you are able to power adequately. We will discuss lighting in detail in later sections of this guide. Bad things can happen when electricity and water meet! Your grow space should be close enough to a water source that you can either carry containers of water to your space safely or connect directly to pipes that can filter, store, or otherwise feed your plants (or the system they’re in). Water weighs about 8lbs per gallon so a full 5 gallon bucket will weigh 40 lbs. Smaller grows with 5 - 10 plants will use 5 or so gallons every other day which likely makes the job manageable. If your grow is large enough so that your plants need 20 buckets of water per feeding then you’ll need to carry 800lbs worth of water to your grow space every other day. In this scenario, it would be highly recommended that you find a direct water source or pipe it in from a safe, discreet location. You’ll likely have a bathroom or some type of water spigot close to you when growing indoors. Guerilla growing outdoors can present other challenges but they are out of the scope of this guide. We’ll discuss water quality and creative ways to store water in later sections. the condition of being protected from or unlikely to cause danger, risk, or injury. Danger - Do not expose yourself to danger by growing in an area that is unsafe or on private property. Do not create dangerous situations by overloading power sources or not properly connecting and maintaining electrical equipment. Risk - Do not grow anything illegal. Injury - Do not hurt yourself while going to and from the garden. Depending on what you are growing and where you live, you will need to be careful. Avoid excessive fan or AC noise and limit foot traffic into and out of the grow area. We caution you to pay strict attention to local, state and federal laws and regulations when planning your next indoor garden. After you’ve found a safe and reliable location with the proper power and a clean water source within reach you’ll be able to start building the grow. Remove any unnecessary items from the grow space and sterilize the room. You’ll want to make sure you start out with as much clean space as possible. Any household disinfectant should work just fine. Tack up panda paper, drapes or something to eliminate light from entering or escaping the room. Visible plywood on the inside or outside of a window in a residential neighborhood is not recommended. The goal is to blend in with your surroundings… the outside should remain just as it was before building your room. Be sure to do a night ‘test’ by standing outside after dark. Make sure you cannot see any light escaping your room before going any further. If you’ve decided to use a grow tent you won’t need to worry about light leaks or plastic coverings on your walls because the grow will be completely contained. Once you’ve cleared out a space for your garden, you’re ready to determine your growing method. Let’s move on. One of the greatest advancements in grow room technology isn't from lighting or hydroponics; it's the simple grow tent! Grow tents make your life much easier, avoiding the costs and headaches of prepping a grow room. 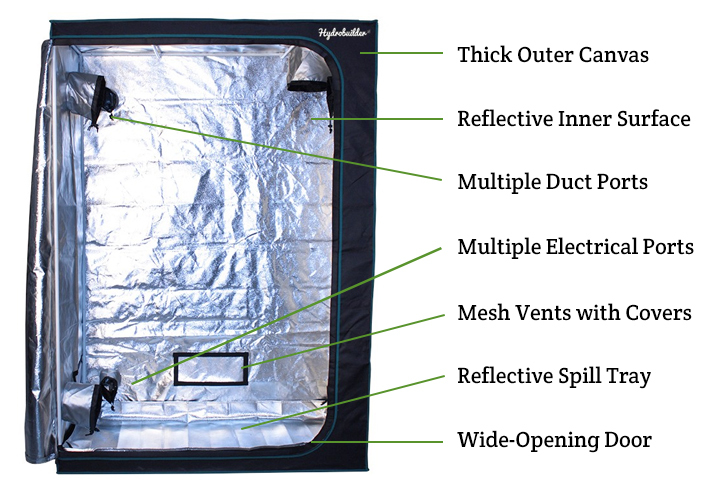 The internal cavity of a grow tent is covered in highly reflective material. It is enclosed in a rigid structure with plenty of ports, windows and vents. 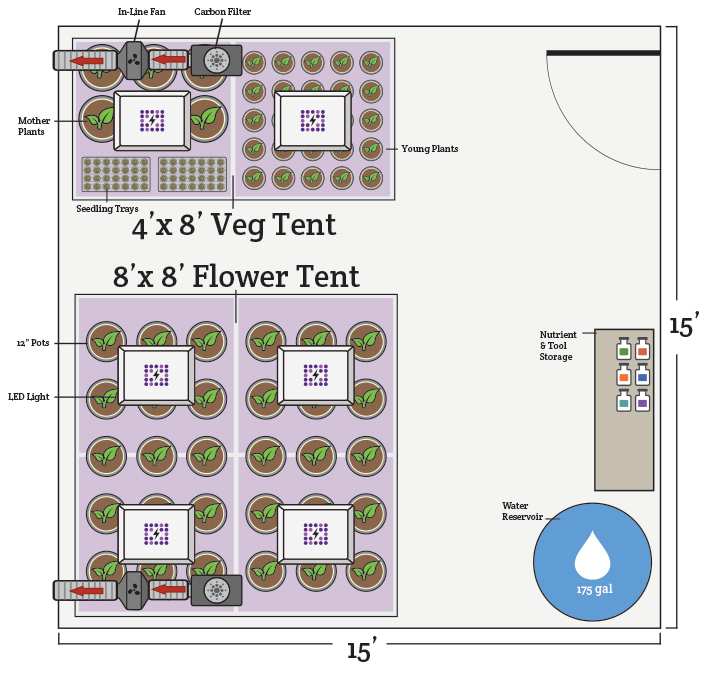 This makes the grow room setup process simpler - build tent, install equipment, start growing! As shown in the example above, it's easy to create a perpetual harvest garden. You can use two tents in the same room; no need to worry about light leaks! At Hydrobuilder, we also carry popular brands like Gorilla Grow Tent and Secret Jardin. If you want to save time and money setting up your grow space, a tent may be your best option. Check out the various sizes available and start planning out how your grow will be laid out. If you have any questions about how to maximize your grow, just give us a call at 888-815-9763! We make shopping easy with our complete grow tent packages. Each package includes everything you need to start growing!